Triumph will take the Rocket Streamliner to Bonneville this month to break the world land speed record. Triumph Motorcycles has confirmed it will attempt to break the world motorcycle land speed record on the Bonneville Salt Flats in Utah this month. Triumph’s aim is to exceed the current record set in 2010 that stands at 376.363 mph (605.697 km/h) using its purpose built 1,000 bhp Triumph Infor Rocket Streamliner. Triumph has a history of breaking the land speed record, and with the exception of 33 days held the title of the “World’s Fastest Motorcycle” between 1955 and 1970. 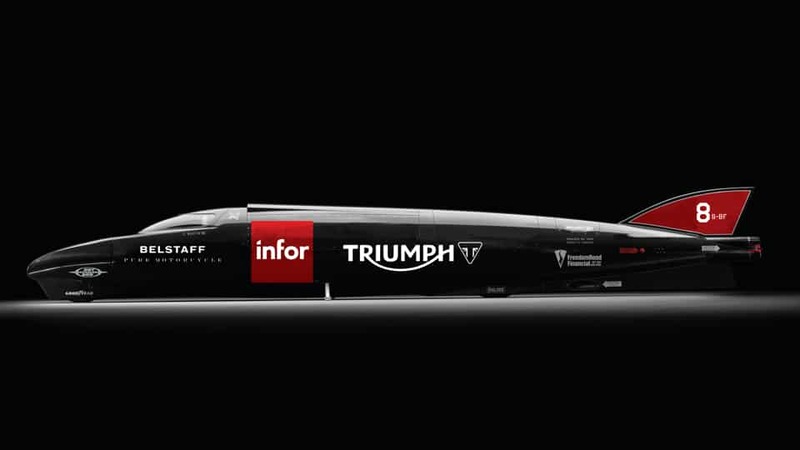 The Triumph Infor Rocket Streamliner has an outer shell constructed from carbon fibre and kevlar and measures about 7.8 metres long, only 60cm wide and 90cm tall. It is powered by two de-stroked and turbocharged 1,485 cc engines from the Rocket III. The engines run on methanol and together they produce 1000bhp or 750kW. It’s projected top speed is 640 km/h. 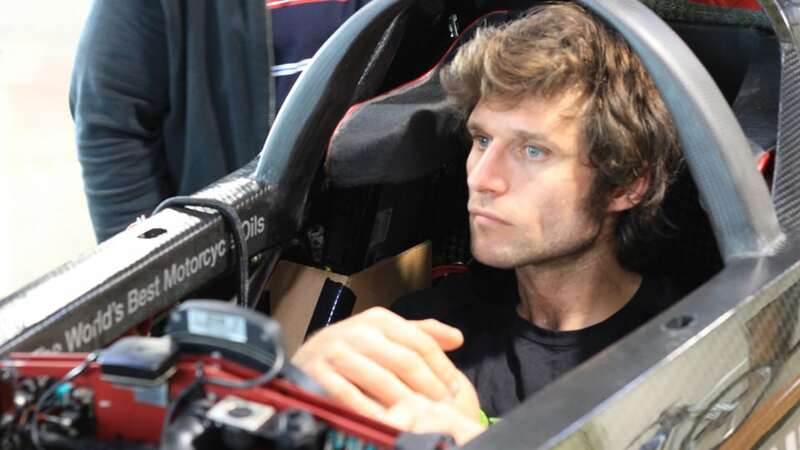 Motorcycle racer and television presenter Guy Martin has been confirmed as the rider. He is well known for his love of speed. He has claimed 15 podium finishes in the Isle of Man, and featured in the 2010 documentary “Closer to the Edge” that followed a number of riders through the Isle of Man TT that year. He set the world record for the highest speed on a Wall of Death earlier this year, and has set a number of other speed records – fastest hovercraft (2014), fastest speed on a gravity powered snow sled (2014) and fastest speed in a soapbox car (2014) which is really a high tech billy cart. Conditions on the Bonnevile Salt Flats haven’t been favourable over the last few years. The last attempt at the record was in 2013, but the run was abandoned because of poor conditions. Triumph had planned to return to the salt flats last year, but a combination of poor conditions and Guy’s injuries from a racing crash caused another delay. A recent update from the Southern California Timing Association that runs the Speed Week event on the salt flats says the surface is good and the organisers have been able to mark out an 8 – 9 mile long course. Infor, a global provider of cloud based applications, and clothing brand Belstaff have been announced as 2016 title sponsors.